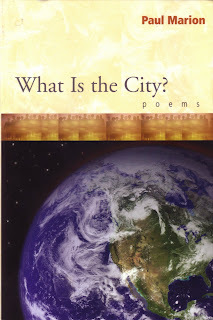 My good friend Paul Marion has a new books of poems out, What Is the City? I first met Paul in the late 70's at a somewhat bedraggled arts festival in Lowell, MA back before it had the lively art scene it does today. I had a display of my calligraphy and Paul gave a reading of his poems. Shortly after I asked for permission to do calligraphic interpretations of his poems and our friendship began. What Is the City? is a collection of old and new, beautifully assembling poems written during a span of over 30 years. The nine parts are each introduced and enhanced by quotations from other poets, such as "Poems are emails from the unknown, beyond cyberspace," from Lawrence Ferlinghetti. I like to think that Paul brought the skills he honed as editor of Atop an Underwood: Early Stories and Other Writings by Jack Kerouac to his own work. 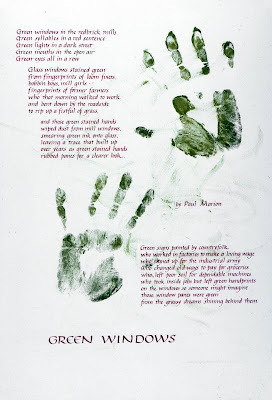 Paul said that I could post one of his poems. It has been a tough decision. There are the old favorites about the mills in Lowell, Dylan Sings to Kerouac (The railroad earth/the hot autumn earth/the cemetery earth/the Lincoln earth/the November earth...), meetings with Ron the Developer and Arthur and his cheese tower, the reflections of a New Englander in Southern California where "Sun turns the whole place into dessert." I finally decided on Vision from 2003 which gives insight into Paul as a community worker as well as a poet. Twenty years ago my boss asked, "What's your vision?" What he meant was, "You don't have a vision." He was my boss at the office, but he wasn't the boss of my writing. He said it after I'd shown him some poems, at which he'd smiled. meaning "You're the one without imagination." We must work together; otherwise we're done for. It's not tragic, not comic, not absurd, not futile, not hopeful. Not a double dream of death or wrapped in a black turtleneck. It insists that in concert we'll make sense and find love. It's grounded in an old stair of a cliché. My boss missed it while looking for the pronouncement. What Is the City? can be ordered from Evening Album Media.